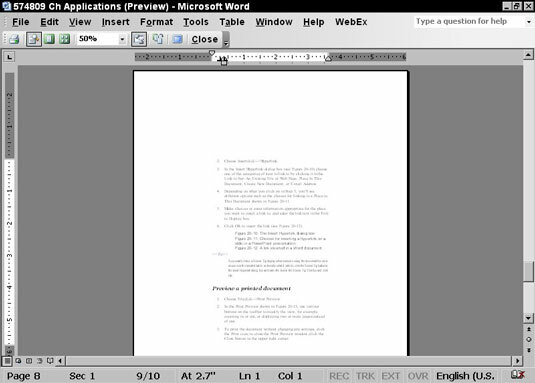 If you display a document in Print Preview in Windows XP, you see how your document will actually look when printed. Print Preview mode can save you the hassle of printing out documents that don’t fit on the page, that have the wrong margins, that print landscape rather than portrait, and so on. When you open a menu such as File in a Windows application, often only the most commonly used options are displayed. Print Preview might be one of those commands not immediately available. You can click the double-arrows at the bottom of the menu to display all choices or wait a few moments for the application to display all available commands. While in Print Preview, use various buttons on the toolbar to modify the view (for example, zooming in or out, or displaying two or more pages instead of one). Many Print Preview features allow you to simply click a previewed page to zoom in and click again to zoom out. A small magnifying glass icon usually tells you what the next click will do. If the icon has a plus symbol, it zooms in, and a minus symbol means that it zooms out. Either Print or Close the Print Preview window. If you want to print the document without changing any settings, click the Print button. If you want to close the Print Preview window, click the Close button in the upper-right corner. To change document settings, such as margin or layout, before printing it, you typically choose File→Page Setup. Some Print Previews offer a Page Setup button to take you to the document settings before printing.